In a job where fitness is key to staying safe and saving lives, a healthy heart, strength, agility and general health are top priorities for firefighters. 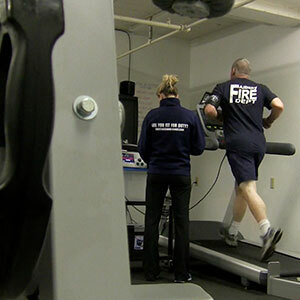 To help ensure firefighters are prepared for what their job requires, College of Public Health and Human Sciences alumna Karlie Moore routinely performs fitness assessments with local fire departments. Karlie learned to perform fitness tests as an undergraduate studying Exercise and Sport Science at Oregon State. According to a 2014 study from the American Journal of Preventive Medicine, firefighters, police officers and security guards have the highest rates of obesity – nearly 41 percent – of all professions. A staggering statistic that gives local firefighters even more reason to keep up on their fitness. “Our fitness individually is very important to make sure that our crew stays healthy and we’re able to do our job – to save lives and pull people from fiery buildings and dangerous circumstances,” Jamie says. 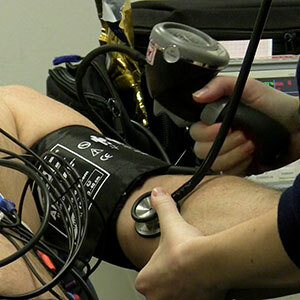 The assessment entails testing all components of fitness, starting with a resting 12-lead electrocardiogram to make sure the firefighter is healthy enough to take the fitness test. It also includes stretching, cardio output, strength level, body composition, skin folds, muscular fitness and more. “You want to make sure you’re not going to strain yourself, and I think with her being so specific we can identify issues or weaknesses we can work on,” Jamie says. In addition to recently teaching Exercise and Sport Science courses in the CPHHS, Karlie started her own business called Fit For Duty Consulting, where she provides fitness testing locally and online. What’s great about her job, she says, is that she’s using knowledge gained at Oregon State in her current profession. “I feel that the two degrees I earned at Oregon State have absolutely prepared me to go out and have a rewarding, effective and fulfilling career,” she says.